Before you have any treatment at TDF you become a member of TDF you will be asked to sign a code of conduct form which is outlined below for your information. Please arrive at least 10 minutes before your appointment. You must declare if you are knowingly suffering from any transmissible infection (including colds and flu), at any time whilst receiving a treatment, (other than that declared on your client record form, and which is not deemed to present any major risk). If you have a carer or need help with transferring, TDF requests that you bring them with you to every visit. If you do not have a carer, but require assistance with lifting or dressing, please notify the centre at the time of booking to check the availability of somebody who can support you. Please ensure that areas being treated are hygienically clean e.g. please wash your feet before reflexology, and bath before a body massage and please wear appropriate clothing that is easy to remove. Underwear should be kept on for treatments. If you take medication on a regular daily basis, please ensure that your appointment is scheduled for at least one hour after taking your dosage and/or finishes at least one hour prior to taking your next dosage. After treatment, it is recommended you drink plenty of water to help flush your system of impurities. 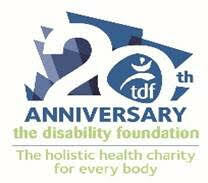 All donations must be made by cheque or cash, as TDF does not have a credit/debit card facility. If possible, please try to have the correct change with you. If you are late for an appointment, please understand that our therapists cannot make up for treatment time lost, as this will cause delays for the following clients. Additionally, you will be charged the rate for the treatment booked, not for the duration time of the therapy, because this deprives another member of a booking. If you are unable to attend an appointment, you MUST give us 24 hours notice at all times, except in an absolute emergency (e.g. illness, extreme weather condition). Failure to attend an appointment without giving 24 hours notice will deprive another member of an appointment. You have disclosed to the best of your knowledge any allergic reactions that you, or your child/guardianship may have and understand that TDF accepts no responsibility for any allergic reactions to food/drink items consumed on the premises. By signing the code of conduct form form, you accept and adhere to all TDF’s Policies, Procedures and Guidelines. All Policies, Procedures and Guidelines are available on request. If you are aged under 18 years you will need a parent/guardian to complete the code of conduct form form. The parent/guardian acknowledges and accepts full responsibility for all bookings and any payment due, relating to my child/guardianship under the age of 18 years. Bookings for Under 18’s will only be accepted from a child’s parent or guardian, with the exception of children’s Counselling. The parent/guardian confirms, to the best of their knowledge, that you have informed the administrative and therapy staff if your child/guardianship suffers from epilepsy/fits.